Last month, the finalists of the Natural History Museum’s Wildlife Photographer of the Year (WPOTY) Awards were announced – and as ever, they were breathtaking. With 50,000 entries from across 92 different countries, it must have been an incredibly difficult decision, but the judges have now picked the winning images. It’s safe to say that words do them very little justice. This year, the Grand Title Winner reminds us that sometimes we ourselves are nature’s worst enemy. The crime scene captured so remarkably by the photograph represents a melancholy highlight, one that is enough to spur you into action, or at least stir up a strong emotional response. This award-winning image, along with the other victors in each individual category, emphasizes that this planet doesn’t just belong to us. It’s shared with at least one trillion other species, and we have the unique power of being able to use photography to raise awareness of this fact. Here’s a selection of the best of WPOTY 2017. Lead image: “Memorial to a Species” by Brent Stirton/Wildlife Photographer of the Year 2017. This year’s Grand Title Winner, and also the winner of the Wildlife Photojournalist Award: Story category, goes to Brent Stirton from South Africa. This image tells a tale of a murdered black rhino, one that was supposed to be protected in the Hluhluwe Imfolozi Game Reserve. The killers, probably under orders from someone, shot the rhino with a silencer before severing off its horn. The horn was probably smuggled to a middleman via Mozambique, where it made its way to China or Vietnam. Tragically, this was just one of 30 similar crime scenes the photographer witnessed in the course of covering this story. "My first child is going to be born in February - I'm 48," the award winner said during his grand prize acceptance speech. "I think I left it such a long time because I kind of lost faith in a lot of the work we see as photojournalists. You lose faith in humanity to some extent." He then remarked that those in attendance at the ceremony - especially the photographers and academics - give him some of that faith back. The Netherland’s Daniël Nelson is 2017’s Young Wildlife Photographer of the Year, and also the winner of the 15-17 years old category. His entry is a far more jovial photograph, on the face of things. 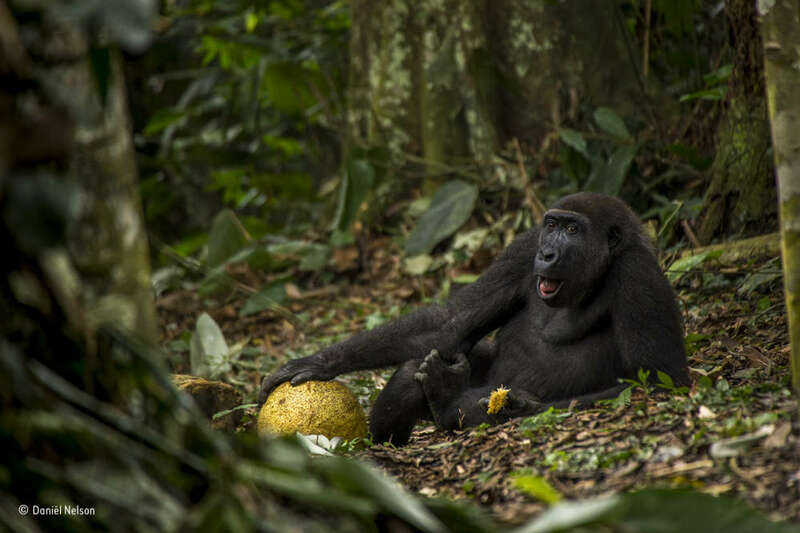 Caco, a western lowland gorilla, is seen here in Odzala National Park in the Republic of Congo. He is 9 years old, and part of the 16-strong Neptuno family – and the day that photograph was taken, he was feeding on a tasty African breadfruit. Soon, this member of a critically endangered species – threatened by illegal hunting, disease, habitat loss, and climate change – will strike out on his own to explore, and eventually, start a family of his own. France’s Laurent Ballesta is the winner of the Earth’s Environments category, and it’s not difficult to see why. 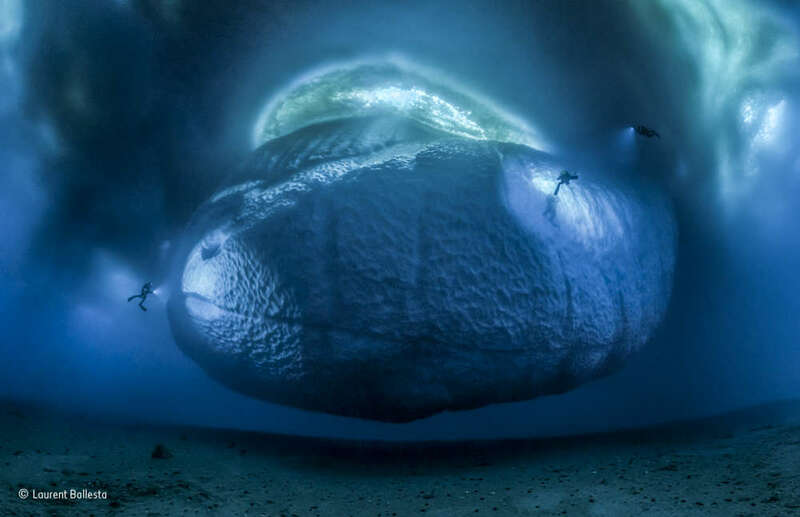 This sub-zero adventurer has a knack for taking some absolutely stunning images of life beneath the most frigid of waves, but this shot of the underside of an iceberg – rarely seen by any human – is arguably his best yet. “None of us could see the whole thing under water. Close-to, it was overflowing from our view. From a distance, it disappeared into the fog,” he told WPOTY. It took 147 images of the beast, stitched together, to produce this final photograph. 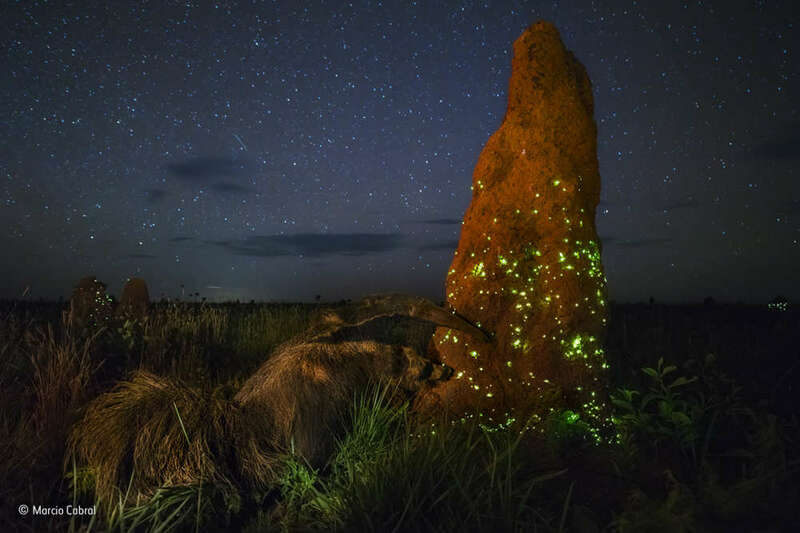 Brazil’s Marcio Cabral took the top spot in the Animals in Their Environment category with his glorious image of termite mounds twinkling under the starry sky, just as they were attacked by a sneaky, giant anteater. This image was captured in Emas National Park, just as the bioluminescent displays of concealed click beetle larvae attempt to lure in the flying termites mating in the air above. 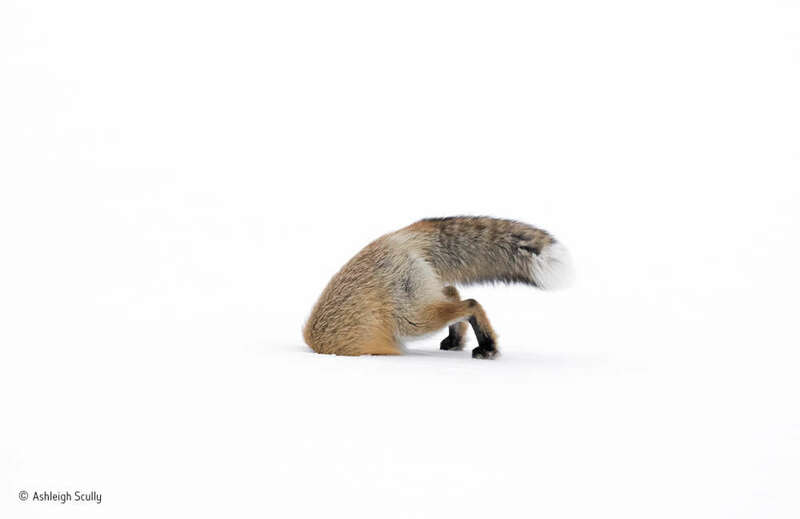 Ashleigh Scully, the US winner of the 11-14 years old category, took this marvelous shot of a female American red fox just as it leapt into the snow covering Yellowstone National Park. These foxes listen carefully to prey moving under the white blanket before pouncing up into the air and down into the snow with unfathomable precision. 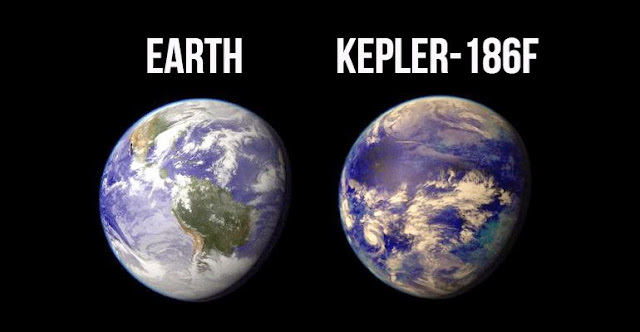 Scientists also suspect that they use the Earth’s magnetic field to guide their jumps. 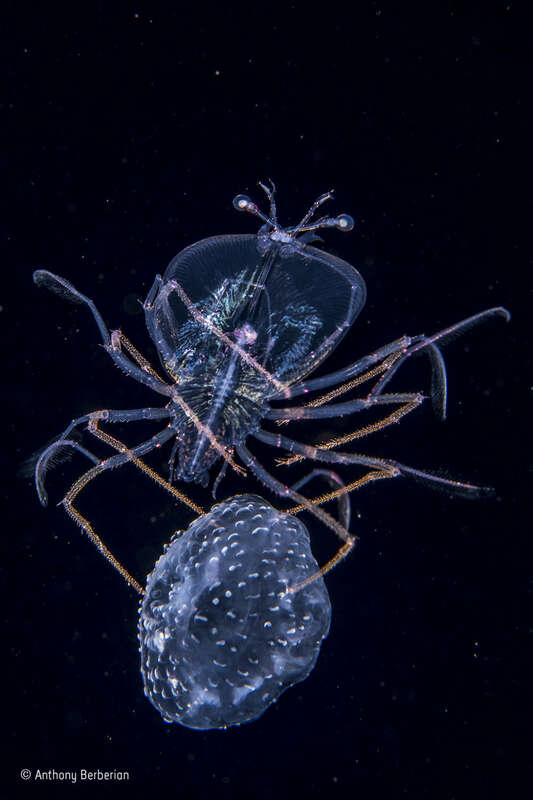 France’s Anthony Berberian was the clear winner of the Underwater category for taking this otherworldly shot of a lobster larva using a small mauve stinger jellyfish as a form of transport. Just old enough to have developed a sting-resistant shell, this little lobster appeared to be steering the jellyfish around, while also grimly using the tentacles as a form of mobile snack whenever it got peckish. Hailing from Ireland and South Africa, Peter Delaney won the award for Animal Portraits for this shot of Totti, a wannabe Casanova wondering why his attempts to woo a female chimpanzee down from the canopy failed miserably. 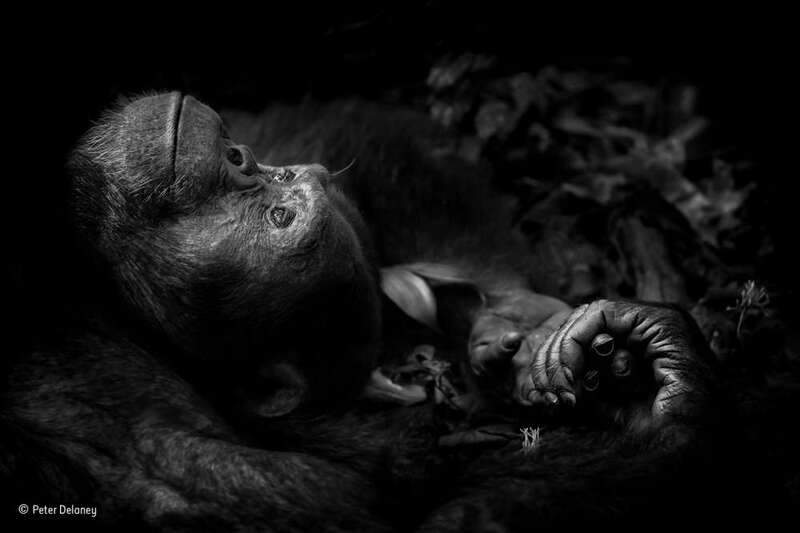 After a vigorous courtship display, complete with gesticulation and pacing, Totti gave up, fell down on his back, and stared upwards into the sky – “dreaming what could have been,” according to the photographer, in Uganda’s Kibale National Park. 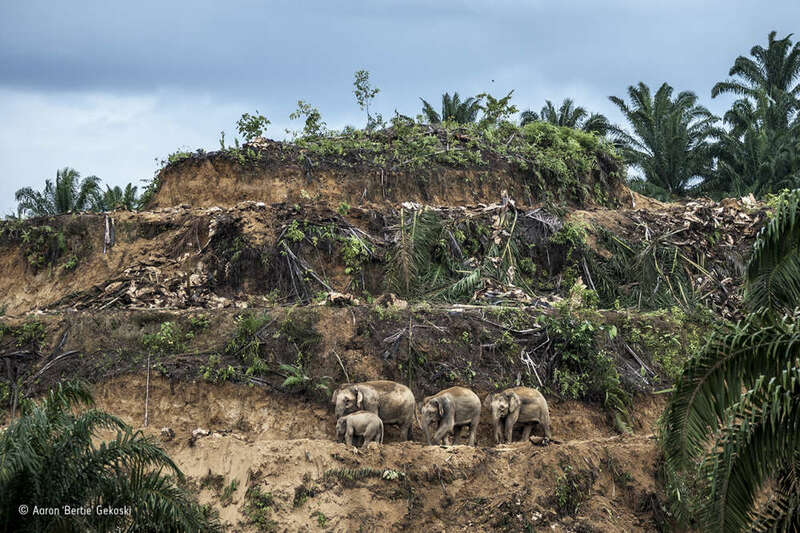 Aaron Gekoski, from the UK and the US, took this haunting image of three generations of Bornean elephants walking through terraces cleared for palm-oil tree replantation. Palm-oil is one of Malaysia’s most lucrative global exports, but as is becoming increasingly clear, the related habitat destruction is putting a variety of species, including orangutans and elephants, at risk of extinction. When escaping elephants come into contact with humans, they are often shot or poisoned, and today, the Bornean elephant – a subspecies of the Asian elephant – is estimated to number no more than 1,000-2,000 individuals. This image, which won the Wildlife Photojournalist: Single Image category, captures that plight in a single depiction of ecological desecration. 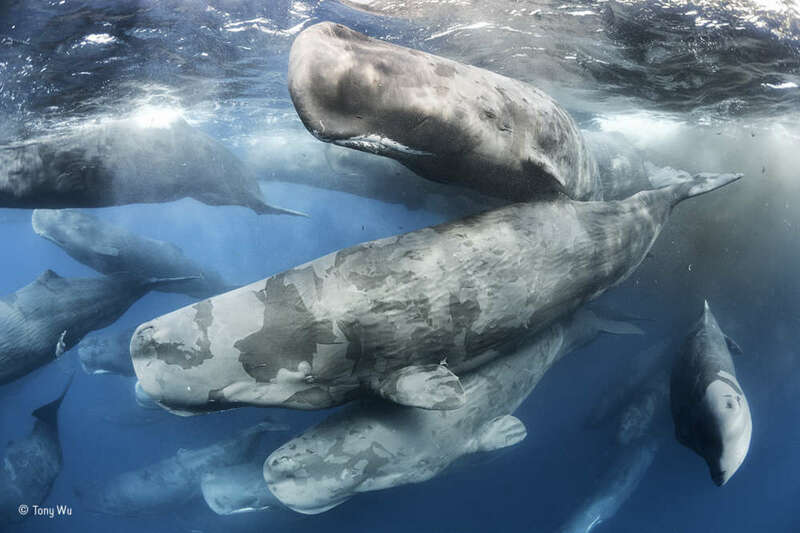 America’s Tony Wu won the Behavior: Mammals category with this shot of dozens of sperm whales mingling off Sri Lanka’s northeastern coast. Although once threatened by commercial whaling, since the ban was enforced in 1986, the population has since begun to rebound – and as photographs like this show, gathering in the Indian Ocean is becoming more commonplace again. Wildlife Photographer of the Year is developed and produced by the Natural History Museum, London. If you want to see the winning images themselves, please visit the museum from October 20 on wards.